EMC Compo 2019 will be chaired by Prof. Er-Ping Li and organized in Zhejiang University International Campus, Haining, Hangzhou, China, Oct 21-23, 2019. The 11th International Workshop on Electromagnetic Compatibility of Integrated Circuits, EMC Compo 2017, has been organized by Petersburg Electrotechnical University "LETI", St. Petersburg, Russia, Tue 4th – Friday 7th July 2017. The 9th International Workshop on Electromagnetic Compatibility of Integrated Circuits EMC Compo 2013, Nara, Dec. 15-18th, 2013, Japan has been the first workshop to be held outside Europe. The workshop was focused on emission and susceptibility issues of digital, analogue and mixed-signal integrated circuits. General chair: Osami WADA, professor, University of Kyoto. 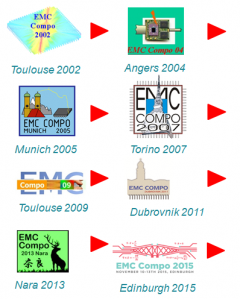 The 5th International Workshop EMC Compo 2005 was organized on November 28th - 30th, 2005 in Munich, Germany by FhG IZM and Infineon. General chair: Thomas Steinecke, Infineon, Munich.